When Is A Bookshop Not A Bookshop? …When it’s my home. And only one of many bookcases, I’m afraid. It’s a minor compulsion and nearly under control; I can deal with it. The habit starts young. My mother had a cavalier disregard for books; she’d plough through them, bending corners, filling them with crumbs, dropping them in the bath, using a fag-end as a bookmark. She’d have made a fine bohemian. I grew up with the same louche attitude and I suppose I assumed that everyone else did. I was so wrong. When I first moved into my old house a suspicious neighbour came to call on me. She had babies and small children clinging from every part of her, all with names that ended in ‘Y’, Joey, Johnny, Bunny, Billy and Eddy. After checking that I wasn’t a police officer (the corner pub was used by coppers) she put me through a vetting process that stalled pretty quickly after she narrowed her eyes and asked what was in all them boxes coming in. We did not become close friends. Soon after, the first of her children hit sixteen and went straight to whatever it is they call Borstal now. The others followed suit as soon as they were old enough. I’m bothered by people who regard books with such deep suspicion. I once asked a woman reading ‘Fifty Shades of Grey’ what she thought of it and she told me it was amazing, fantastic. She also volunteered the information that it was the first book she’d ever read. ‘So, what are you going to read next?’ I asked. ‘I’m just going to read this one again,’ she replied happily. Apparently some people are scared to go into bookshops. My publicist told me that they’re happy to buy books in WH Smith because it’s like Woolworths used to be, and just happens to sell books too, but Waterstones is too posh because it has armchairs and nice lighting and you must be an intellectual to go in there. The funny thing is that the people buying books in WH Smith bought many more books than the ones in Waterstones. And yet they didn’t think of themselves as readers. ‘Oh, I just buy trash,’ said one, embarrassed. She was reading Robert Harris – hardly trash. These people were asked; ‘If shops were celebrities, what would WH Smith and Waterstones be?’ They decided that WH Smith was Jeremy Clarkson and Waterstones was…Nigel Havers (which says something about their age). Waterstones are now allowing their managers to adapt stores to their catchment areas, to make them homelier and more friendly. God forbid we start to think reading is for the posh – we’ll be turning back the clock 200 years! In the London riots a few years ago it was reported that in several places every shop was looted except the local branches of Waterstones. They were untouched. I saw Nigel Havers in my local Waterstones. Can I claim a prize? My late mother, who was horrendously well-read, divided books into two kinds, which, on reflection, was just to wind me up: ‘Poncy’, and ‘Bob Hoskins’. She wasn’t particularly into art, and once pointed out a biography of Jean Cocteau, which lie on a table next to a Clive Cussler novel, and was amused by the disparity. I always feel very uncomfortable if I go into a house, and no books are visible. I have shelves of books at home, which I have noticed the occasional visitor peering at, in the manner that they might catch something from them. I have, mischieviously, put books on the shelf to upset and annoy, too. Several books on horror movies, including the classics by Denis Gifford, and Alan Frank. Some large-format books by the famous Soho ‘character’, and brilliant broadcaster, Daniel Farson. A lovely,saucy book by Dita Von Teese. Dennis Wheatley’s ‘The Devil And All His Works’. A huge tome on the art of the Indiana Jones movies. Next to that is a related book, that has caused a fair bit of consternation – it’s entitled ‘The Nazis And The Occult’. That, of course sits next to a book about the V-1 and V-2 missiles, which sits next to the Haynes Workshop Manual for the Saturn 5 Apollo Rocket. In the hall, is another bookshelf with mainly fiction, a lot of classical works, from ‘The Epic Of Gilgamesh’, and ‘Histories’, by Herodotus, through to modern works like John Connolly’s beautifully dark and sinister short story collection, ‘Nocturnes’. Your Bryant and May books have a shelf to themselves, to allow for expansion. 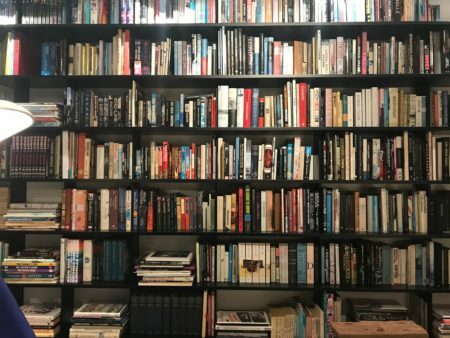 Ian Luck – Your bookshelves sound most interesting,worthy of a long mooch around on a grey afternoon,like all the very best second hand bookshops. I have to confess that owing to lack of space,my bookshelves have to be ‘seriously’ looked at at least once a year. That’s when charity shop donations and ‘ maybe these can go upstairs into the box room’ have to be decided on. Thankfully,’im indoors doesn’t collect books! He reads mine. When we viewed the house in which we currently live, a young couple lived here. They had a toddler daughter and there was not a single book in the whole house. Now we’re building a library room in the garden to deal with the amount of paper in our house. My ‘safety valve’, if you will, for books, is that I take a good many to work, and every few months, my line manager will leave me a note saying that the Seamen’s centre needs some more books (I work at a Port), and do I have any to spare? I can usually fill a black bin bag. Still got a cupboard full, though. God knows what the users of the centre think, as my reading choices aren’t mainstream, or even ‘this weeks big thing’. I do now regret giving away the ‘Erast Fandorin’ books by Boris Akunin, now that I think of it. Have to buy them again, I guess. Given that WH Smith is Clarkson and Waterstones is Havers, I was wondering about The Works. I thought of Fred Dibnah, but Ian’s mother had the answer, it’s Bob Hoskins. We’ve given up on shelves it seems and are piling things on the floor with the exception of his rail modeling magasines which have been given milk crate semi permanent storage. I am arbitrarily using S and Z randomly as I am annoyed by the whole question. Ah, Boris Akunin…another great author whose work is hard to find in US. Peter Tromans – Yes, I can see that. I would nominate Oxfam bookshops as Fred Dibnah – they are usually full of old, interesting stuff. Brooke – The end of ‘The Winter Queen’ actually reduced me to tears. It was such a sad ending, coming out of nowhere. It meant that I had to read the others, and what a rewarding journey they give. Ian–I started with Sister Pelagia. I was fascinated by the author’s choice of a female hero and the irony of her name. I then discovered ‘The Winter Queen.’ So beautifully tragic. I recently watched Akunin and Walter Moseley (Easy Rawlins crime fiction) discuss how they write (YouTube). If you haven’t seen Akunin in action, it’s worth it. Thanks for the reminder–will now go in search of more Akunin. Why do we do it to ourselves? We keep fiction and say we only read it once. There are free libraries (good ones around here) and means of giving books away, borrowing from and returning to friends, but still we turn our homes into fire traps. Still, while unable to go library visiting I have been able to find books here that I haven’t read for a long time and at least one that I hadn’t read at all. I’ll be starting on Bryant & May again soon. Chris – I just finished ‘Hell Train’. I started at about lunchtime, and could not put it down. Thanks for such a great story, and a really evocative sense of ‘family’ in the Hammer organization, even down to a mention of the canteen manageress. Hammer’s movies of 1967 are possibly my favourites. Prem’s self- destruction at the end of ‘The Mummy’s Shroud’ did my head in when I first saw it, and it’s still deliciously unpleasant, even now. Nice to see the mention of the Milk Marketing Board’s promotion – I have pictures of the stuntman (Eddie Parker?) in Prem’s wrappings, drinking milk, in promotional pictures. The main adventure could be made today – I’d like to see what Guillermo Del Toro would do with it. Anyhow, I loved this book. Cheers! Boris Akunin has just had another Fandorin novel published in English (All the World’s a Stage) with another coming next year.